In order to demonstrate how this works I am creating a sample subscription pack with the name ‘New Monthly Subscription Pack’. 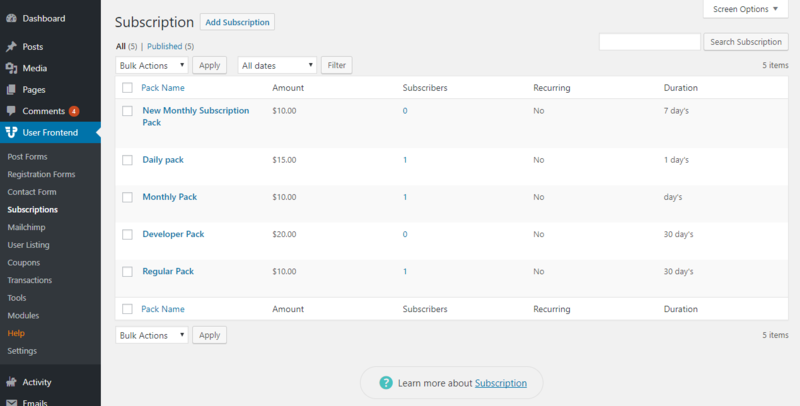 After adding the new subscription pack this is how it appears with the other subscription pack lists. 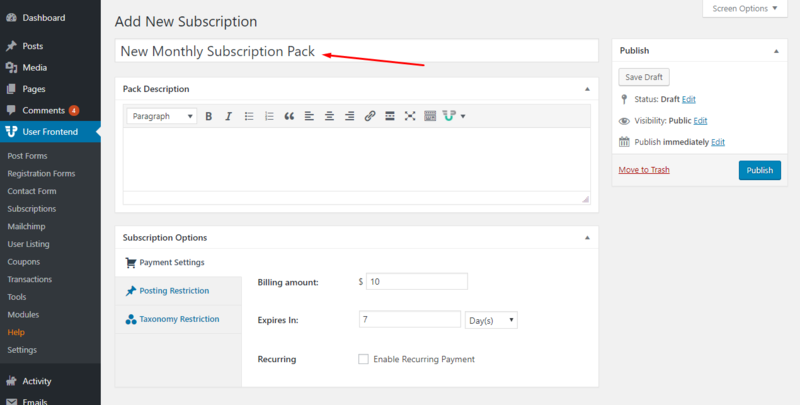 After adding any new subscription pack you can edit and change several option of this page according to your requirements. Pack Description: This Field allows the author to describe the pack details for the customers. 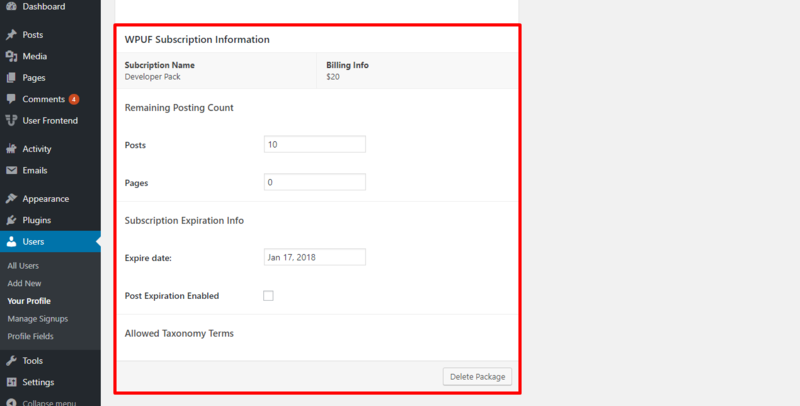 Billing amount each cycle: This field lets the admin to set the billing amount of each cycle. 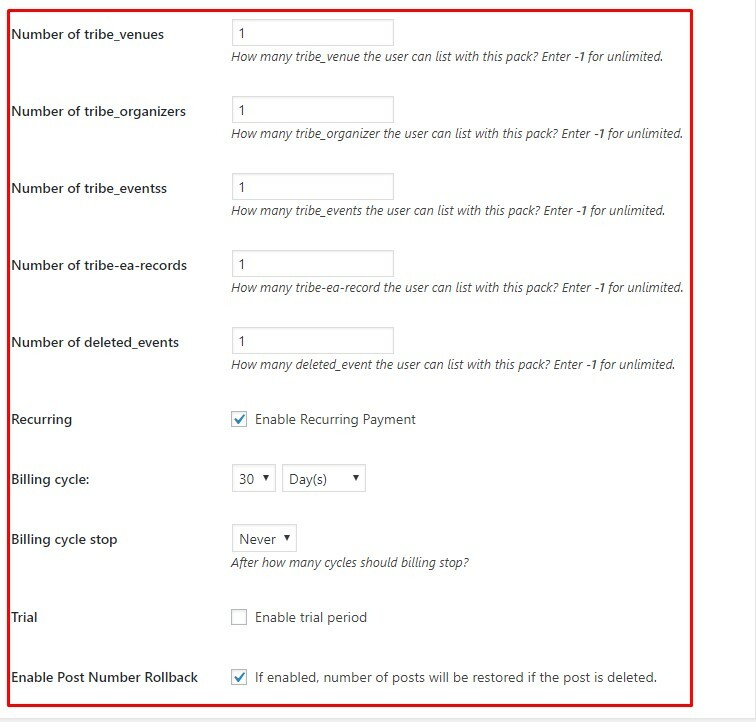 Enable Post Expiration: Enabling this option will generate an option below to set post expiration period. Post Expiration Time: In this field you can set the post expiration period. Send Mail: Ticking on this option will send email to the admin when expiration period exceeds. Post Expiration Message: This field lets the author to write the post expiration message to be displayed for its customers. 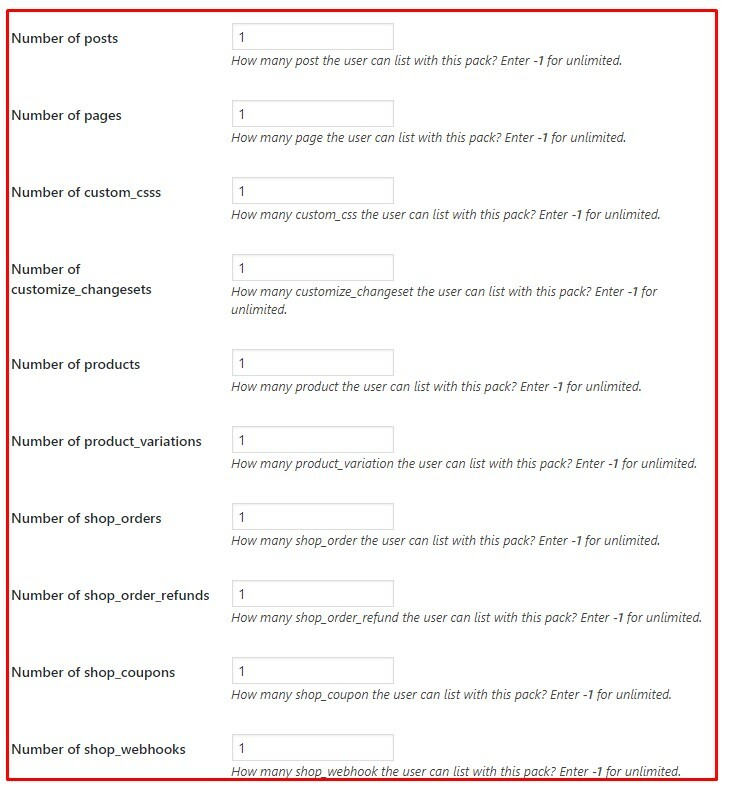 Number of posts: This field limits the number of post a customer can post with this pack. Number of pages: This field limits the number of page that can be listed with this pack. Number of custom_csss: This field limits the number of custom_css that can be listed with this pack. Number of customize_changesets: This field limits the number of customize_changesets can be listed with this pack. Number of products: This field limits the number of products that can be listed with this pack. Number of product_variations: This field limits the number of product_variations that can be listed with this pack. Number of shop_orders: This field limits the number of shop_order that can be listed with this pack. Number of shop_order_refunds: This field limits the number of shop_order_refunds that can be listed with this pack. Number of tribe_venues: This field limits the number of tribe_venues that can be listed with this pack. Number of tribe_organizers: This field limits the number of tribe_organizers that can be listed with this pack. Number of tribe_events: This field limits the number of tribe_events that can be listed with this pack. Number of tribe-ea-records: This field limits the number of tribe-ea-records that can be listed with this pack. Number of deleted_events: This field limits the number of deleted_events that can be listed with this pack. Recurring: Ticking on this option enables the recurring payment system. 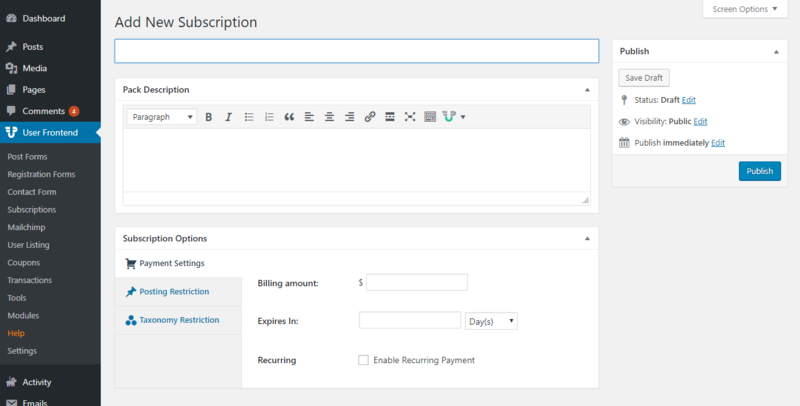 Billing cycle: This option allows the admin to choose their desired billing cycle period. Billing cycle stop: This option allows the author to select after how many cycles the billing should stop. Trial: Ticking on this, enables the option of setting a trial period for its customers. Enable Post Number Rollback: Enabling this option will restore the number of posts that are deleted. 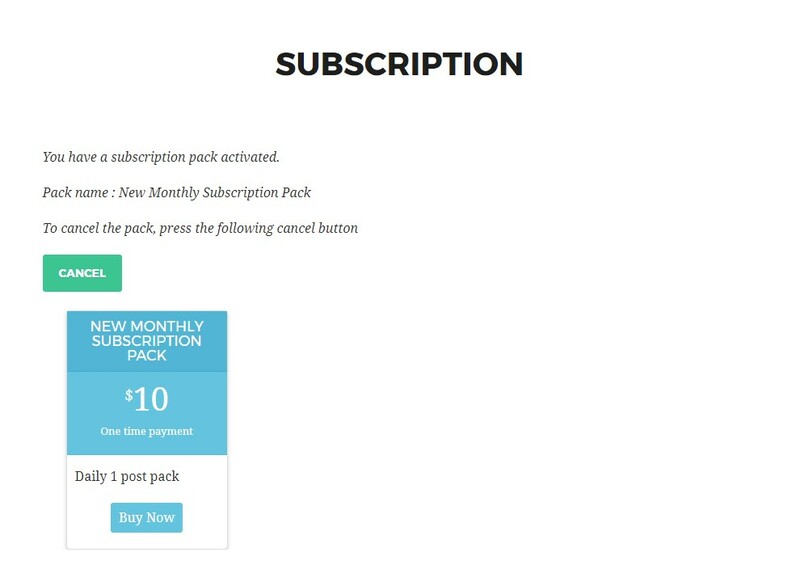 Here is my newly created subscription pack to buy for the customers in the frontend. 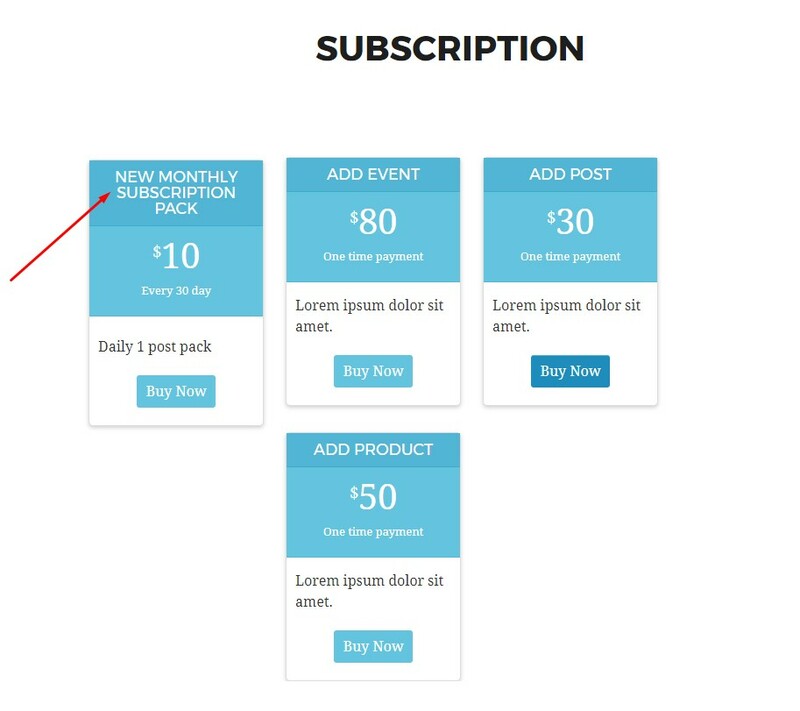 A user can simply click on ‘Buy Now’ to buy their desired subscription pack by clicking on the Subscription Tab at the top of the User Frontend web page. In this page a customer can choose their suitable payment method, add discount coupon code or change the current pack. 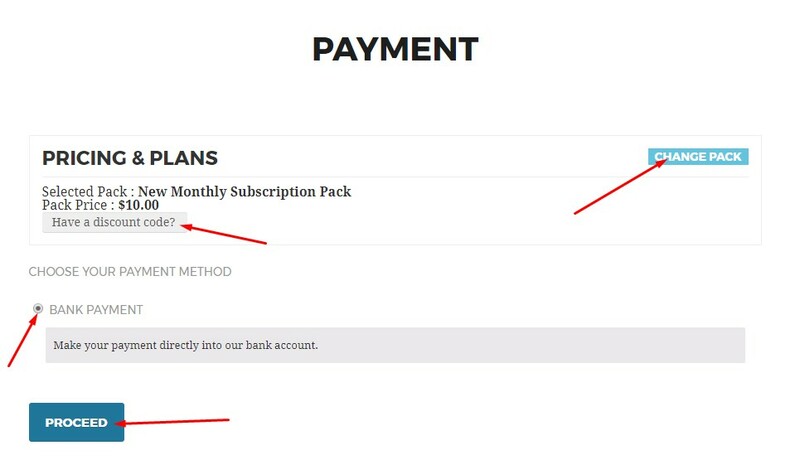 By clicking on ‘Proceed’ after selecting all their required options, the order of buying the Subscription pack will be processed. After the order is received a confirmation message of the order placed of buying the chosen subscription pack is displayed on the customer’s screen. 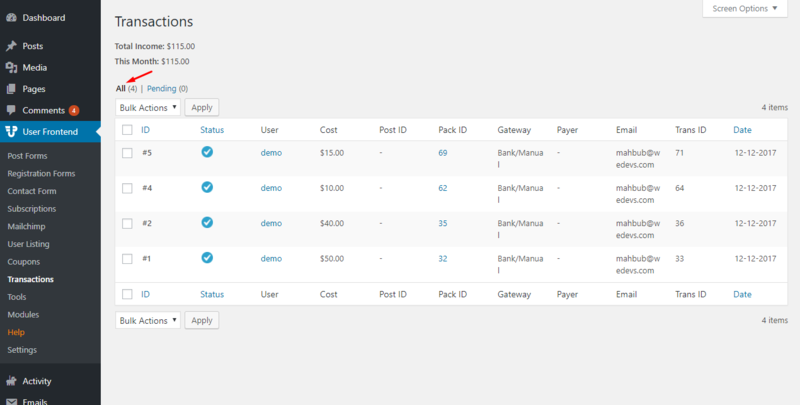 Checking on the Transactions tab of User Frontend will display the lists of all the accepted subscription pack user by default. 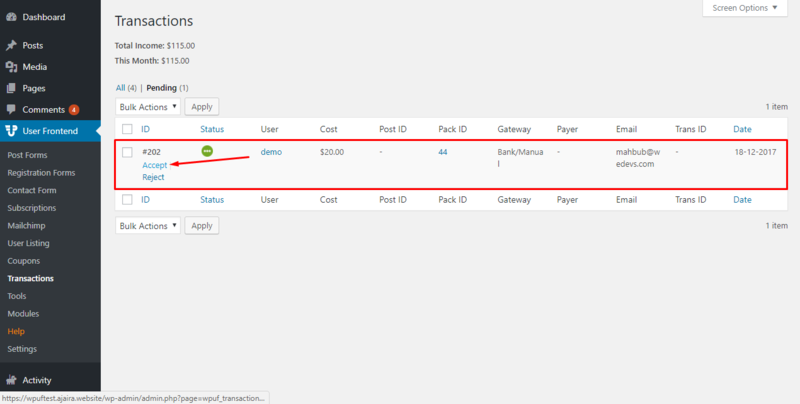 At the pending section of Transaction tab the admin can check all the list of user’s pending Subscription pack order request. From the pending section the admin accepts or rejects any pending subscription pack order request. 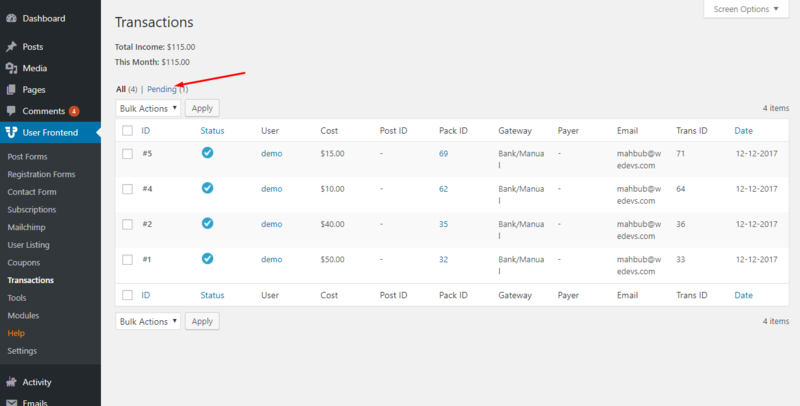 After accepting a pending subscription pack order request, the user is automatically added to the ‘All’ section lists of Transactions. 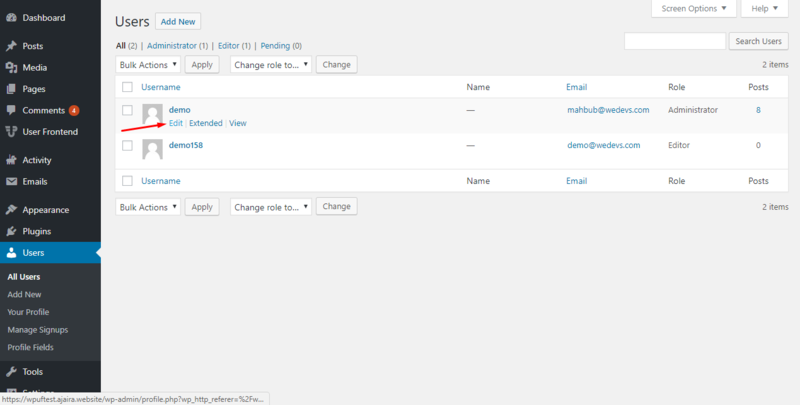 From the All Users tab, the admin can view and edit details of all the users subscribed to the website. 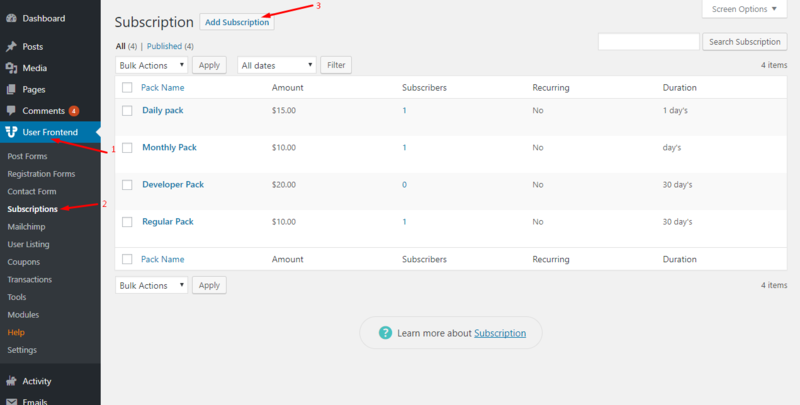 WP User Frontend Subscription details of a particular user can be viewed by the admin in the user profile page. 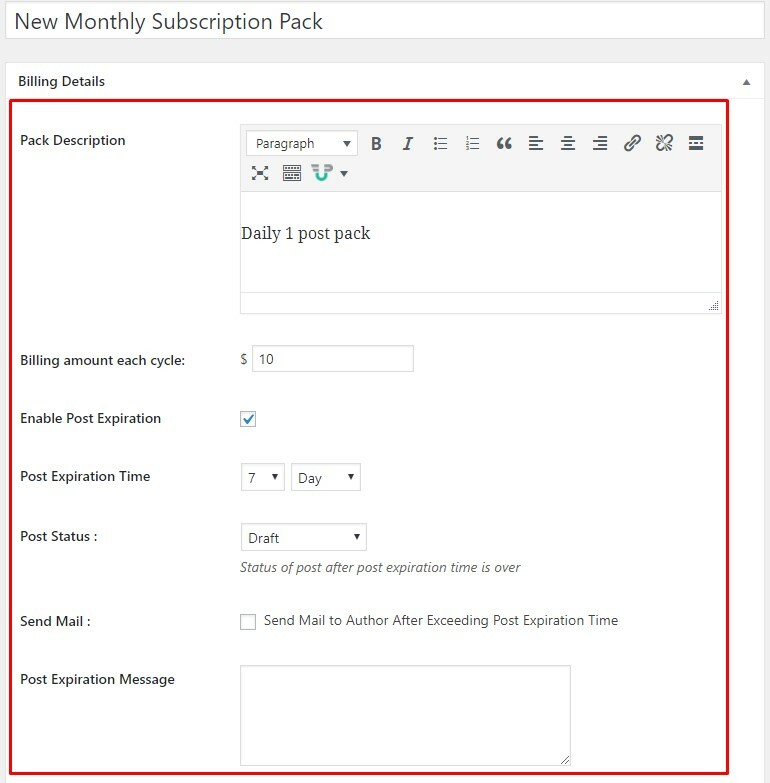 After the bought subscription pack is activated by the admin, a notification message is displayed on the subscription page of the customer as it can be seen in the above image.